Some of the most memorable New Orleans’ restaurants are perhaps not the most fancy or flamboyant ones. 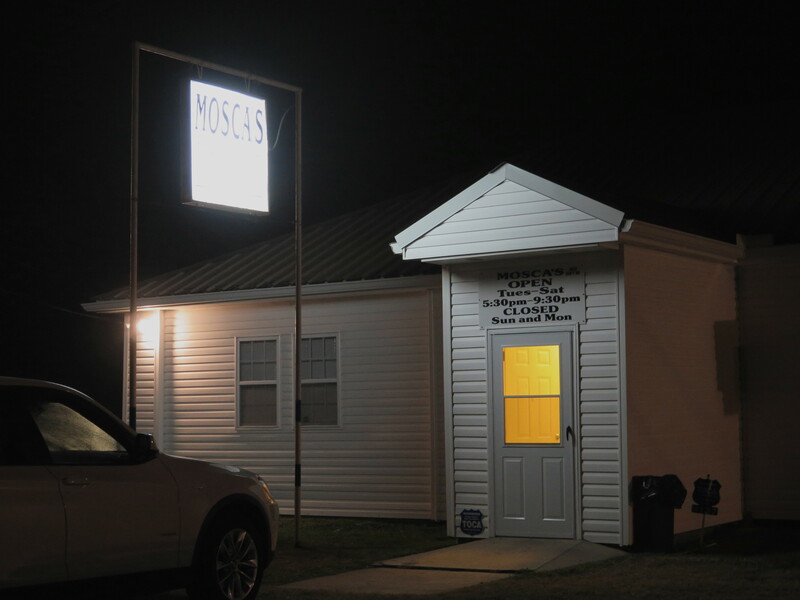 Mosca’s Restaurant is one that you have to search out; but it is a unique Louisiana experience. Mosca’s is an Creole Italian Restaurant. I dined there years ago and fell in love with the Garlic Chicken. We decided to search it out again. 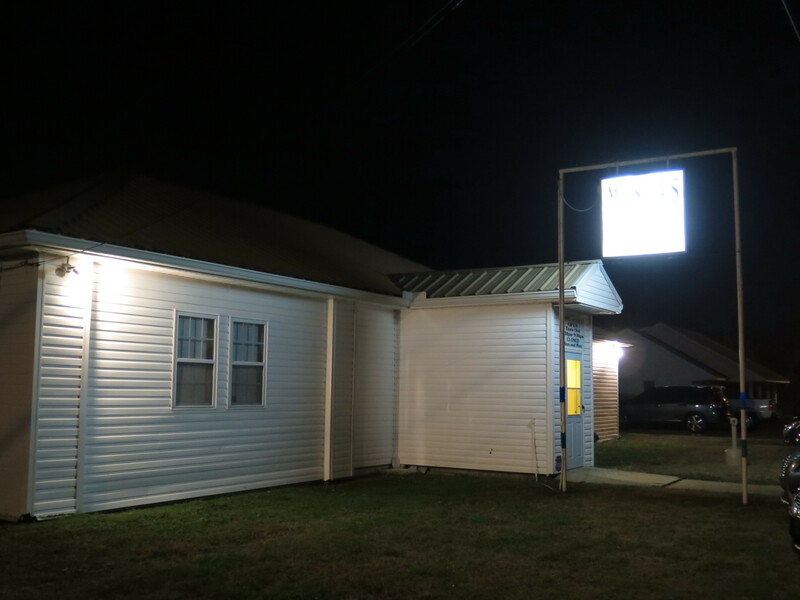 Mosca’s Restaurant is in a rural area across the Mississippi River from New Orleans on the West Bank. As you cross the expansive Huey P. Long bridge (with a large railroad trestle down in the middle of bridge) leaving New Orleans, it doesn’t take long to enter rural Louisiana. Mosca’s Restaurant about 15 miles out of the city in a small, white and very unassuming building along Hwy U.S. 190 surrounded by swamp. Entering the restaurant is a step back in time. An old jude box and decorations from years past fill the walls. The wood floors and tables appear as if they’ve never changed. The menu is very simple–only a few items–and it hasn’t changed either; Garlic Chicken is still there. The waitresses are friendly, smiling and many have worked at the restaurant for years, too. The menu is a blend of Creole and Italian foods. Spaghetti and Meatballs, Oysters Mosca, Italian Crabmeat Salad, Roasted Potatoes, Spaghetti Bordelaise and Shrimp Mosca are on the menu. All are delicious. Although pricey, the dishes are served on large family style platters–enough to feed several guests. My husband likes to tell the story that Mosca’s Restaurant was founded by Al Capone’s chef who moved from Chicago to New Orleans to start a restaurant. Mosca’s WEB page, however, denies this fact. 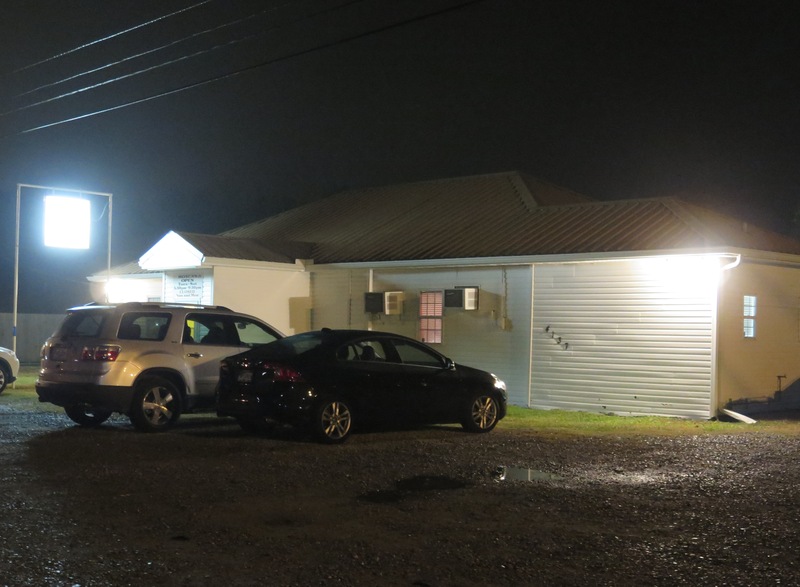 Nevertheless, the restaurant is in a building still owned by the Carlos Marcella family, a New Orleans crime family. Mosca’s was founded by, Provino Mosca, an Italian immigrant who came to this country in 1913. He learned the restaurant trade from his wife’s family and operated a restaurant in Chicago Heights, Illinois. Eventually he moved to New Orleans and started a small restaurant on the West Bank in 1946. In the early years, gambling was legal in Jefferson Parish. So his patrons would visit his restaurant late at night after the clubs closed. The restaurant has survived all these years. It did not suffer any flooding during Katrina but was closed temporarily for wind damage. The restaurant is still owned by descendants of the original owner. The authentic and delicious Italian menu makes the drive to this outlying restaurant worth the trip. The recipe is a very simple one. A whole, cut up chicken is pan fried in lots of olive oil on the stove over an hour with seasonings of salt, pepper, rosemary and oregano. Fresh garlic and dry white wine are added at the end. 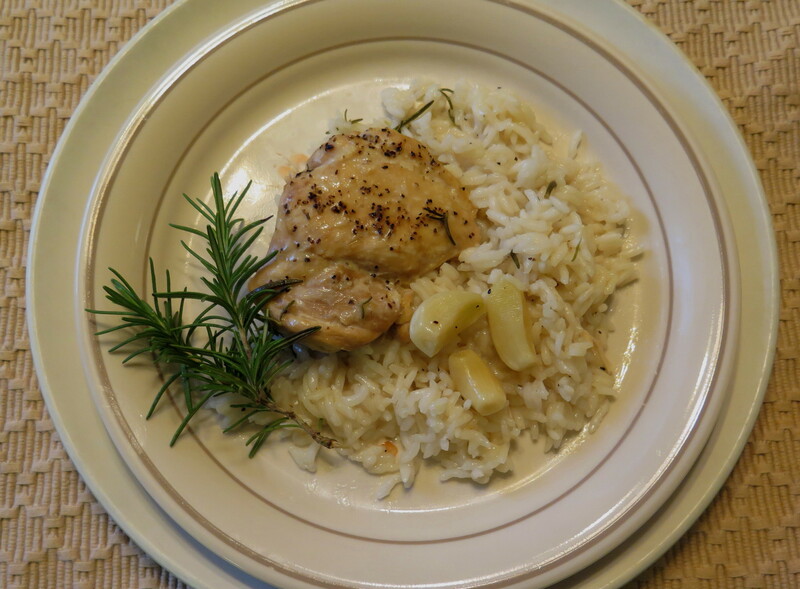 The chicken was tender and the rosemary and garlic flavors complemented the chicken well. Sometimes it’s best to leave the recipe for the restaurant to prepare. I tried making this dish several times and never really mastered Mosca’s technique. Chicken breast pieces take much longer to cook than legs and quarters. Mine turned out dry. And frying chicken in 3/4 cup olive oil with a Tbsp salt were more generous portions than I’m used to using. 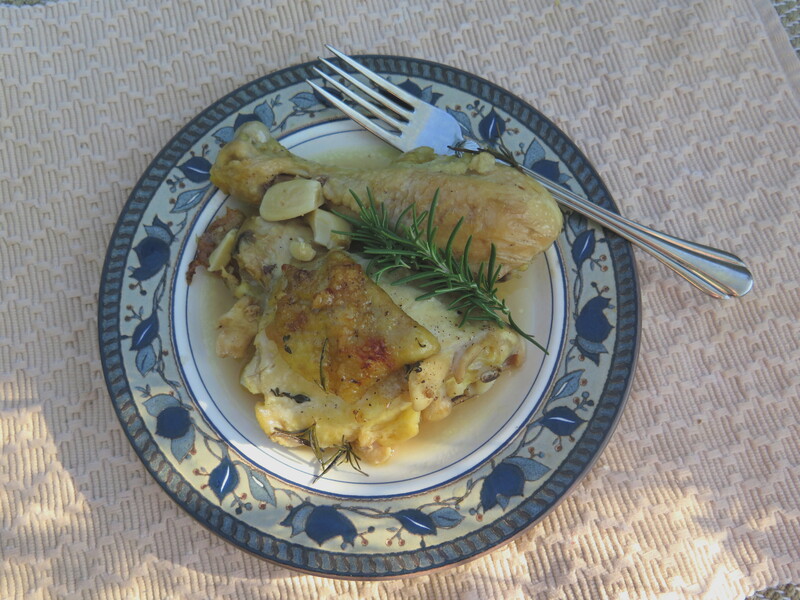 Plentiful garlic cloves, with the chicken basted in white wine, are the flavors I remember. Eventually I made two variations which captured the essence of this dish. Both were made with with dark meat–one with chicken legs and thighs and one with boneless thighs. I baked both dishes in the oven rather than frying them and cut down on the olive oil and salt. Here are the ingredients for my first variation (except I forgot the white wine). I seared the chicken legs and thighs in a small amount of olive oil. Then I seasoned them with salt and pepper and placed the pieces in a roasting pan. I added a entire clove of garlic, fresh rosemary and thyme from my garden and dry white wine. I covered the casserole dish with foil and baked until tender. Here’s the result. I tried the same idea using boneless and skinless chicken thighs, to make a low-fat variation. 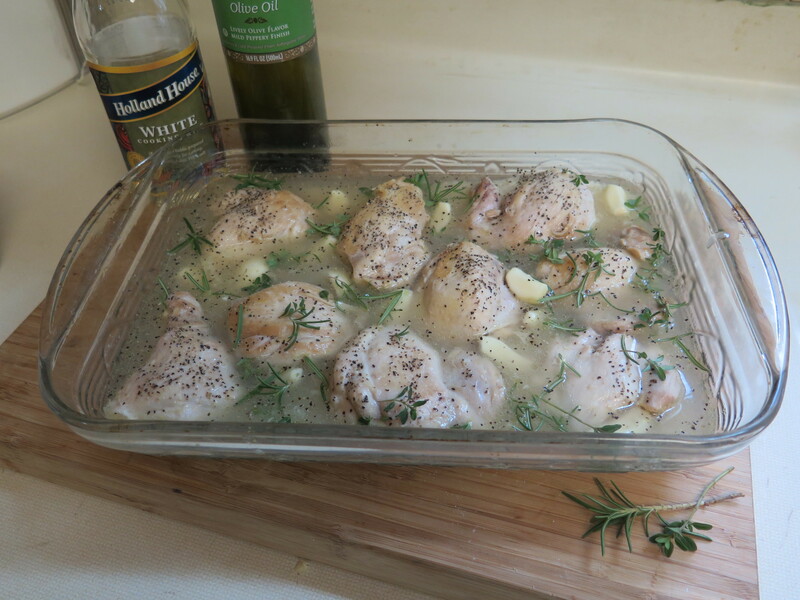 For this variation, I baked the chicken thighs in the same seasonings adding rice, chicken broth and dry white wine. Again, I seared the chicken pieces in olive oil to render off some of the fat, added the rest of the ingredients, covered the casserole dish tightly with foil and baked for 50 minutes until the rice was fluffy. Here’s the dish ready for baking. With this variation, the chicken was tender and the rice was flavorful. The garlic cloves were soft. Um! Wash and dry the chicken pieces, removing as much excess fat and skin as possible. Season with salt and pepper. Heat olive oil in large non-stick skillet over medium high heat. Add the chicken pieces and fry until browned, turning several times. Transfer chicken pieces to casserole baking dish. 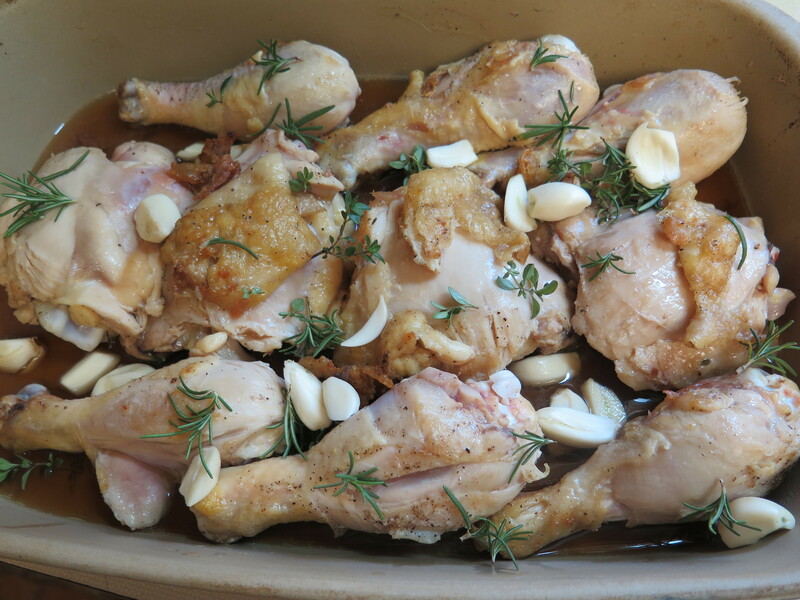 Sprinkle the garlic cloves, rosemary and thyme evenly around the chicken. Pour white wine around the pieces. Cover tightly with aluminum foil or a lid. Bake at 350 degrees for an hour. To serve, place 2 chicken pieces on plate, pour some of the chicken juices and garlic over each piece. For garnish, serve with additional sprigs of fresh rosemary (optional). Heat olive oil in large non-stick skillet over medium high heat. Add the chicken pieces and sear until browned, turning several times. Season with salt and pepper. Add dry long grain rice to casserole dish. Pour the chicken bouillon dissolved in water and dry white wine over the rice and stir to combine. Place the chicken pieces over the rice in the casserole dish. 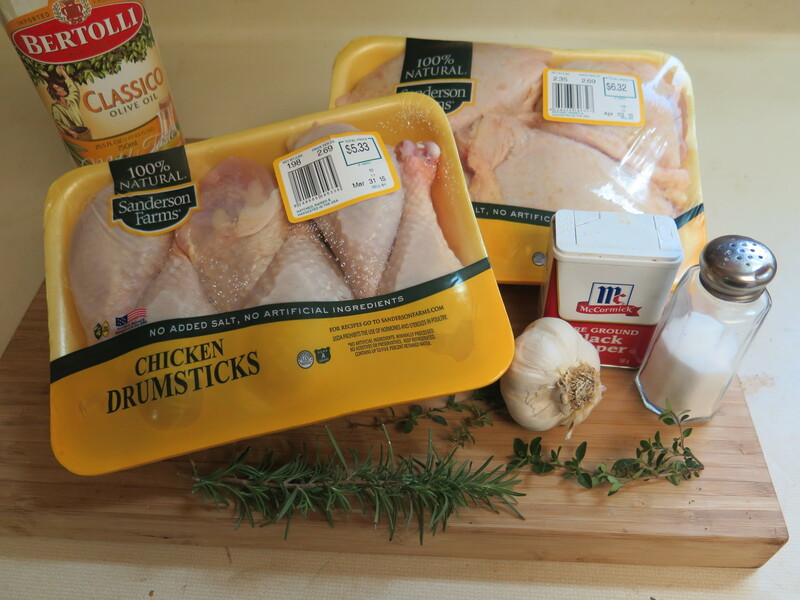 Sprinkle the garlic cloves, rosemary and thyme evenly around the chicken. Cover tightly with aluminum foil or lid and bake in oven for about 50 minutes or until the rice is tender. To serve, place rice on each plate, top with 1 – 2 pieces of chicken and several cloves of garlic. For garnish, serve with additional sprigs of fresh rosemary (optional). New Orleans has so many outstanding restaurants, sometimes it’s hard to pick one. If you are seeking an authentic and local experience, I recommend Mosca’s. We visited the restaurant on a cold, rainy night and knew where to go. But if you are from out-of-town, take a GPS (or map), the restaurant is hard to find in the dark. It is very unassuming on the outside; warm and cozy on the inside with great Italian food and friendly waiters. 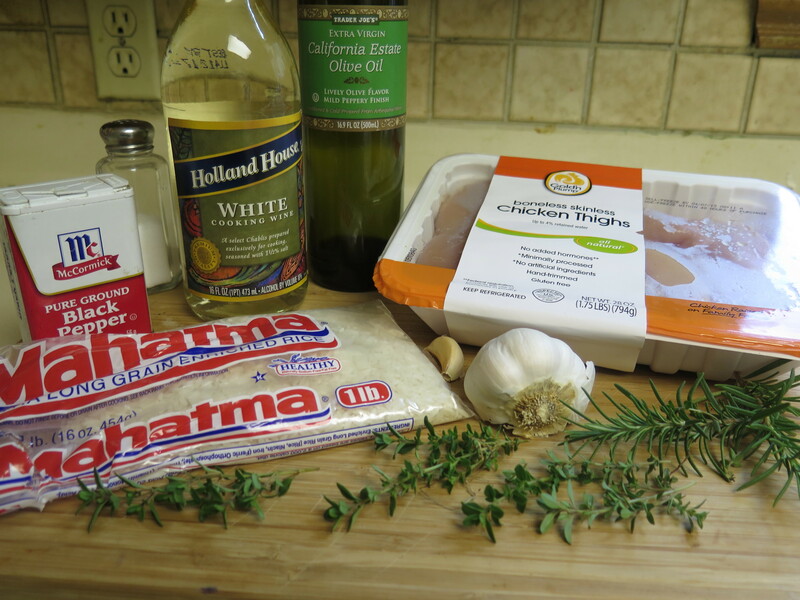 This entry was posted in Louisiana Culture, Recipes and tagged Creole Italian Restaurant, Garlic Chicken, Low-fat Garlic Chicken variation, Mosca's Restaurant, New Orleans Restaurants by Maylee at Beyond Gumbo. Bookmark the permalink.